While India is perceived as an emerging market, the stories of the plundering of natural resources and the systematic annihilation of the indigenous peoples go unheard. In this race to make India a superpower, and a growing media industry that champions this idea, social inequality has reached its zenith, and easily gets pushed aside. What, then, is the future of the people who grow food with their hands; who have long been guarding forests and rivers – even before climate change could touch them? Why does the media shy away from reporting about the majority of its populace, even while they silently die from landmines and malaria alike? Reporting on the ‘hidden civil war in India,’ Priyanka Borpujari, an independent journalist based in Mumbai, reports and photographs from the dark territories of mineral-rich India, which are rife with violence and disease, which are only silenced. 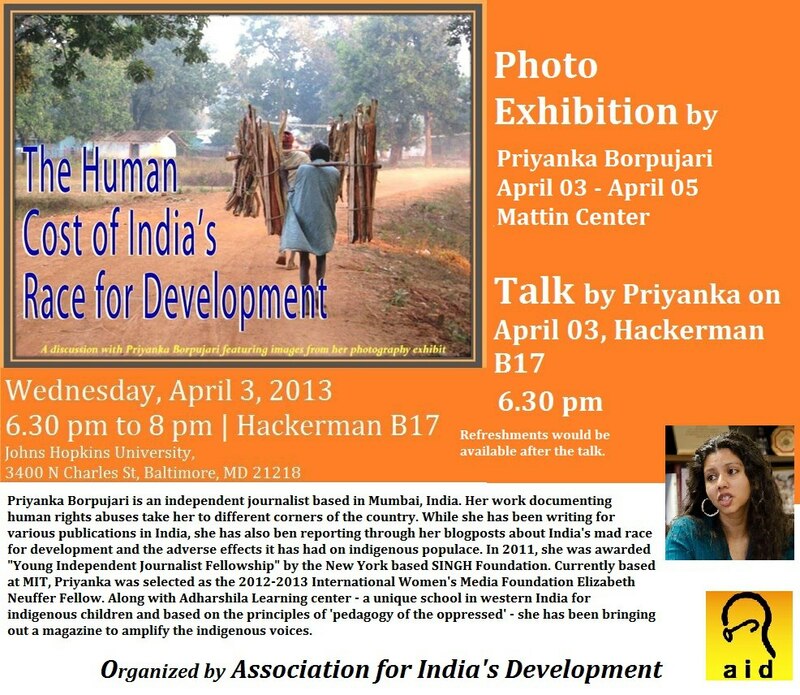 Priyanka Borpujari is an independent journalist based in Mumbai, India. Her work documenting human rights abuses take her to different corners of the country. While she has been writing for various publications in India, she has also ben reporting through her blogposts about India's mad race for development and the adverse effects it has had on indigenous populace. In 2011, she was awarded "Young Independent Journalist Fellowship" by the New York based SINGH Foundation. Currently based at MIT, Priyanka was selected as the 2012-2013 International Women's Media Foundation Elizabeth Neuffer Fellow. Along with Adharshila Learning center - a unique school in western India for indigenous children and based on the principles of 'pedagogy of the oppressed' - she has been bringing out a magazine to amplify the indigenous voices.